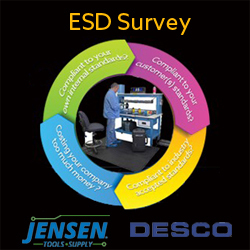 JENSEN Tools + Supply has partnered with DESCO to help its customers optimize their investment in ESD control with a free, on-site ESD control survey. January 3, 2017 -- JENSEN Tools + Supply recently celebrated 38 years of partnership with DESCO, a multinational firm that specializes in the manufacturing of products for ESD control in electronics manufacturing. This partnership has allowed JENSEN Tools + Supply to offer its customers a comprehensive complimentary ESD Control Survey. Electrostatic Discharge (ESD) is one of the most challenging safety issues faced by businesses involved in the manufacturing of electronic products. Greater ESD awareness and control not only impacts productivity, but also improves product reliability. As a result, companies are investing heavily in ESD programs to make their manufacturing processes more efficient and reliable. As one of the leading providers of superior-quality products and solutions to the electronics manufacturing industry, JENSEN Tools + Supply seeks to leverage long-time business partnerships that provide value-added solutions to its customers. JENSEN Tools + Supply and DESCO have over 20 years of experience providing comprehensive ESD surveys to their customers to help optimize their investment in ESD control. When asked about the company’s ESD Control Survey Service, Steve Riel, product manager at JENSEN Tools + Supply said, "ESD damage costs the electronics industry millions of dollars per year. We are offering our customers a free, on-site ESD control survey so that they can identify and eliminate latent, difficult-to-detect defects and take necessary control measures to avoid quality problems and cost issues resulting from electrostatic discharge." This complimentary ESD control survey service will be provided by expert representatives of DESCO, a company that has been in business since 1956 and has its manufacturing facilities in Japan, UK, and USA. When interviewed about their long-time business partnership with JENSEN Tools + Supply, Jeffry Brake, brand manager at DESCO said, "A large number of businesses rely on DESCO’s quality ESD control products like wrist straps, bench mats, and heel grounders to maintain effective ESD control. I believe that the partnership with JENSEN Tools + Supply will help DESCO reach more business and help them optimize their ESD control practices." By opting for JENSEN Tool + Supply’s complimentary service, businesses can benefit from an expert evaluation of their facility, identify the sources of ESD, and establish long term, efficient static control solutions. For more information, please email news@JensenTools.com or visit the JENSEN Tools + Supply website at http://www.jensentools.com/services/esd-survey.